I was recently pointed to an early publication paper that went up on the Proceedings of the National Academy of Sciences website on Monday, where a research group at India’s National Institute of Plant Genome Research describes two genes from tomato that, when knocked down by RNAi*, result in tomatoes that can remain ripe but not spoiled for up to three times as long as tomatoes where these two genes function normally. Their approach targets specific genes involved in breaking down certain proteins found in the cell walls of tomatoes (in fact in the cell walls of all plants). Breaking down the cell wall is a key part of ripening in fruits (which the tomato is, botanically if not culinarily). Which makes sense if you’ll think about it for a moment. One of the traits we associate with ripening is getting softer, from bananas to peaches if it’s still crunchy when you bite into it, it wasn’t ripe. What makes plants stiff and crunchy? The strength of their cell walls. Since, unlike vegetables, fruits WANT to be eaten**, as they ripen they begin to break down their cell walls to make themselves more appealing to passing animals. Unfortunately, ripening and spoiling are, in a lot of ways, the same process. If fruits aren’t eaten when they become ripe, they continue to get softer, transitioning from delicious looking -> unappetizing -> inedible -> a puddle of mush on your kitchen counter. Preventing ripening entirely is relatively easy, and there are plenty of known mutants in tomatoes and other species that never ripen (these naturally mutant tomatoes stay green and hard no matter how long you wait). But getting part of the way to ripeness but stopping before crossing the line into spoiled is a much less tractable problem. A spoiled tomato. A rotting tomato is visible in the bottom left, but that's the result of the growth of microorganisms which is a more complex process. Cropped version of a photo from goldberg on flickr. Click to see the original photo on flickr. To the non-cell wall biologist like me, one of the most attention grabbing parts of this paper was figure 3A, which simply shows photos of tomatoes that have been sitting at room temperature for 10, 20, and 45 days***. At ten days all the tomatoes look fine. By twenty days, the control (normal) tomatoes are shriveled. After 45 days sitting on the scientific equivalent of a kitchen counter the control tomatoes are basically brown balls of goo, while tomatoes with either of the two genes identified in this paper knocked down show no change in appearance over the same period of time. So what are these awesome genes? Both genes studied in this paper are glycosyl hydrolases, a kind of enzyme that breaks the chemical bond holding a sugar to either another sugar or some other molecule, like a protein. Specifically the two genes, which are normally expressed in ripening tomatoes, each break specific kinds of sugar off of a specific kinds of protein found in the cell walls of plants. Plant cell walls are mostly made of hydrocarbon polymers like cellulose and lignin, but plants also use some structural proteins (usually less than 5% of the cell wall) and it is the sugars attached to these proteins that the glycosyl hydrolases studied here act upon. This is where it gets scientifically cool. 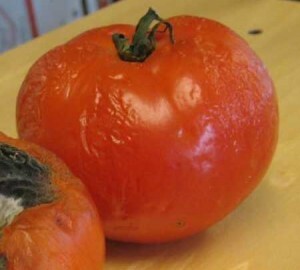 The prolonged ripe-but-not-spoiled state of the transgenic tomatoes they produced wasn’t simply a result of preventing the structural damage caused by the break down of the bonds between cell wall structural proteins and the sugars they’re connected to. Instead, when they looked at gene expression in plants where either of these two genes had been knocked out, they found that genes involved in breaking down cellulose, lignin and pectin (the main components of the cell wall) were also less expressed. 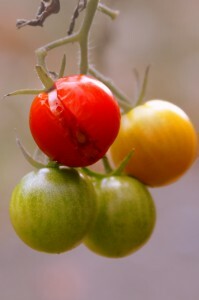 The authors speculate that the kinds of sugars/carbohydrates these two genes break free from cell wall structural proteins actually serve as a signal to the plant to increase the production of all the other proteins needed to break down cell walls and in their transgenic plants, that signal never comes, letting the tomatoes stop ripening before the process leads to spoiling. The authors themselves point out the huge potential upside to reducing spoilage in the developing world. As much as 50% of produce is lost to spoilage between harvest and diner plate in the developing world. Reducing spoilage is one of those rare almost-a-free-lunch opportunities to increase the food supply without bring more land under the plow, or increasing the inputs (in the forms of fertilizer, pesticide, and all to often back-breaking manual labor). The shipping test out of Mexico, however, proved to be yet another disaster. It was designed to test, not only whether the Flavr Savr gene would enable vine-ripened fruit to survive 2000 miles in a truck … The test results were clear before the vehicle came to a complete stop. Tomato puree seeped from the truck’s back end. Fresh market tomatoes, in nor cal, are all picked green and gassed with ethylene to force ripening (imperfectly). In the midatlantic, virtually all tomatoes have a natural gene mutation that prevents them from ever ripening completely in the first place. Either way, you end up with an inexpensive, pretty, red tomato that’s often hard and white on the inside. Heirloom varieties taste great, but are very susceptible to pests, have to be hand picked and turn to goo shortly after ripening. When Pamela Ronald of Tomorrow’s Table talks about the development of transgenic crops, she points out that by 2015, it is projected that more than half of transgenic crop varieties will be produced by the national research labs of developing countries like India, China, and Brazil for they own farmers. If this paper is a sample of the sort of research such labs produce, 2015 should be a truly fascinating year for agriculture. 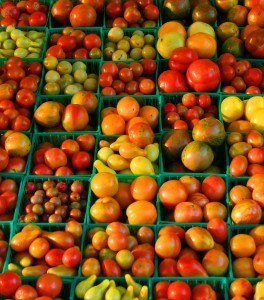 -The gene knocked down in the Flavr Savr tomato was Polygalacturonase. -The two glycosyl hydrolase genes studied in this paper are alpha-mannosidase and beta-D-N-acetylhexosaminidase. **When a plant produces a sweet and tasty fruit in the wild, its goal is to attract some animal that will eat the fruit and carry the plants seeds to someplace new where the seeds can grow into new plants. Domestication has changed the rules of that bargain somewhat, as we artificially selected for bigger and tastier fruits, but fruiting plants still trade animals (us humans) food in exchange for having the seeds of their species distributed across whole fields by farmers, and have their growth protected and nurtured by human hands and human ingenuity. ***There’s also numerical data which is probably better science (the images only track two fruits of each type which I’m sure isn’t statistically significant), but the best scientific papers will include hooks like that image of unrooting tomatoes to draw the reader in long enough to read the exciting data itself. Posted in: agriculture, biology, Genetics, Plants. I’m glad you enjoyed it. I normally aim for short and sweet, but this entry kind of ballooned. I wonder if sometime in the future this research could be applied to allowing fruits that go bad really fast, like cashew apple, mangosteen, or pawpaw, to last long enough to finally have a commercial market. Yeah, everything for tends to go back to ‘What can this do for fruit:),’ but working on post harvest traits for to prevent spoilage in developing countries is a much more noble goal. Although I can’t help but already hear critics (if this is ever implemented commercially in the US) complaining about this allowing those big nasty large corporate farms to ship their tomatoes more easily…or something like that. Irony would be when the horrible tomato being sold used was a GE Brandywine or Cherokee Chocolate taking advantage of this. I would imagine it would depend on how fruits like the cashew apple go bad, and whether they follow the same ripening process as the tomato”Climacteric fruits” ones that give off a lot of the plant hormone ethylene and speed up their metabolism during ripening, though you may know more about the process than I do (I had to look up Climacteric when I read it in the paper). The Flavr Savr failed for non-GM reasons. I don’t remember all the details but there were dumb mistakes like putting the transgenic construct in a low-yielding, poor quality background. I was also once told that a lab came close to commercializing a Botrytis-proof strawberry some years ago, which I think would be a blockbuster. The Flavr Savr did what it was supposed to do, but, at least from the perspective presented by Belinda Martineau in First Fruit which is just one person’s perspective on everything that went wrong, the business side of Calgene oversold the changes of the Flavr Savr tomato to themselves (for example deciding that tomatoes which kept longer on kitchen counters could ripen on the vine and then be treated like green tomatoes for purposes of harvesting and shipping) to their whole business model was based on a false set of assumptions about how how cheaply tomatoes could be grown and distributed. I can easily see that same mindset convincing them they didn’t need to worry about the conventional breeding of tomato varieties they were using. These things are great. It will help eliminate hunger.